I have referred to a slightly new layout I have introduced to the living room once the new west elm rug was positioned . Before I write a post about that I wanted to share this special table with you. It was gifted to us several years ago. My parents carried it with them all the way from India. It is an antique piece and unusual because of its octagonal shape. 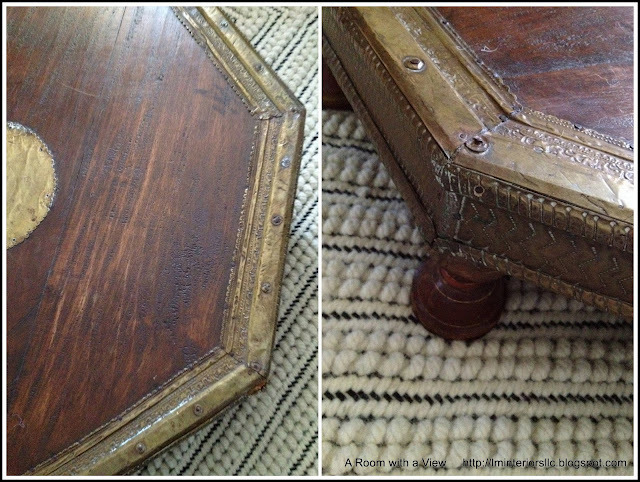 About 31" in diameter and just 7" high, it has adorned the living room as an end table. It has graciously stood beside a couple of different occasional chairs as I moved things around and has been used to showcase framed photographs, some of my National Geographic magazine collection, and a table lamp as well as a few objets d'art. All along I believed I could put it to better use with more focus on it. It has a rustic look and certainly that global feel with the aged, hammered brass around the edges. The legs are not perfectly straight but that is part of its unique quality. It has been moved to a new spot and I am working on styling it, details of which I will share with you very soon. Can you tell that I really like to mix things up a little? I have not been able to publish a blog post as frequently as before but I will get back to it soon. I am trying to pin down the kids' after-school schedule﻿ more accurately - particularly that of my high-schooler - but activities have picked up in the last couple of weeks. Weekends are similarly busy and I am also trying to finish up my Professional Organizing course before the holidays are upon us. As always, thank you so much for your visits and comments.